Congrats to my new blogger friend Sasha! To kick off her new blog design she is hosting a blog hop and some great giveaways! To show my support I am giving away one of my favorite products! This is my interactive emotion book focusing on the emotions: happy and sad! This product is intended to support students who may have difficulty understanding rules and how their actions make others feel. Interactive books are a great way to gain students attention and keep them engaged in anything you are teaching! I use this book at the beginning of school once we have gone over all of our classroom rules and routines. We will read through the story and I ask students how they think this would make there friends and/or teacher feel. 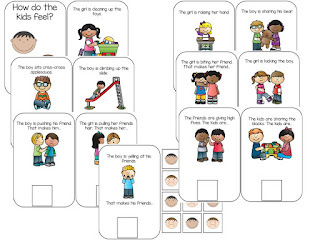 Students will then come up and move the correct emotion (happy or sad) to the corresponding pictures. Not only does this work on rules and routines but it also focuses on emotions. This is also a great review after long breaks or when new students enter the classroom. For students who are having difficulty following the classroom rules and routines, I will form a small group, or individually, and re-read this book with them. I have also sent this book home with students who are struggling at home and/or at school. Interactive books make reviewing rules and routines fun and engaging! Thanks for stopping by my blog and if you do not win this giveaway and would like to purchase a copy for yourself click on the above picture and it will take you to my Teachers Pay Teachers Store. Thank you for linking up & for your donation.